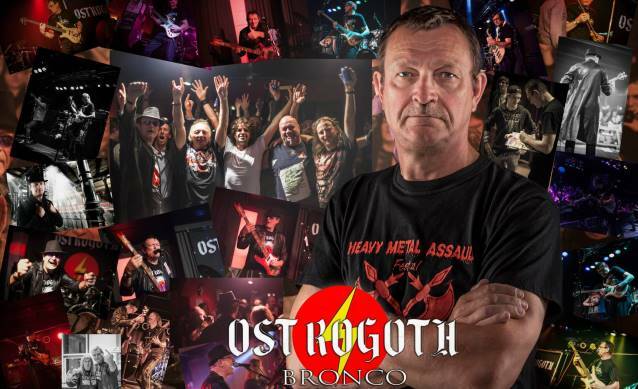 Co–founder and bass player Marnix "Bronco" Van de Kauter has decided to leave Belgian metal legends OSTROGOTH. His decision was a hard one to make, but the band's heavy touring schedule for 2014-2015 — which will only increase with a new album scheduled for release January 2015 — was causing a conflict with Bronco's personal life. Here is Bronco's personal statement: "It is with deep regret that I am announcing my departure from OSTROGOTH. I have made this decision after a hard and long deliberation with myself and the rest of the band members. The growing interest OSTROGOTH has generated over the last few years has been very rewarding, but has also put a strain on my personal life. The time and effort that needs to be put into playing and writing in a band is more than I can deliver at this moment in my life. Therefore I have decided to step aside and let the band — which I helped found and have always and will always support — grow further." OSTROGOTH wishes to thank Bronco for all the years of hard work, having contributed his bass-playing ksills during the writing process for "Full Moon's Eyes" (1983), "Ecstacy And Danger" (1984) and "Too Hot" (1985), as well as the many club tours in Belgium and abroad. 2010 was the year of the second reunion for OSTROGOTH and Bronco stood by his tribe until time told him to take a break. Says the band in a statement: "We will always remember Bronco as our thunderbass warrior during long, musical battles. We know Bronco will stay near us and help us out when necessary. This is not a goodbye, but rather a 'see you later…'"
OSTROGOTH and Bronco's replacement have worked hard in recent weeks and are ready to start this week's concert series with shows in Germany, Austria, Italy and Belgium. The new OSTROGOTH lineup will be announced later this week.